CPU is the abbreviation "Central Processing Unit", and most times -to a computer salesperson or a computer geek- CPU is referred to a processor. CPU function like the brains of living organism, as such we can call CPU/Processor as the brain of a computer. This is because, it is responsible for the processing of all instruction given to a computer by the computer operator (the individual using the computer). So every operation that is carried out, including but not limited to, key strokes, opening and closing programs, creating and editing graphics, and saving files are all processed by the CPU. Let us use the human brain as an example to help you understand this fact. Let us suppose you want to take a step. Your mind -though under control by the brain- tells the brain that you want to take a step. In turn the brain, the brain will receive the message from your mind, understand it, and sends out necessary instructions to the muscles and tissues about your intent, and this in turn will make you to take the step you had intended. This is exactly how the CPU of a computer function. The arithmetic logic unit (ALU) of a CPU is the unit that does the actual arithmetic and logical operations passed on to it by the computer Operator. The Control Unit (CU) on the other hand is what manage the various parts/components of the computer. 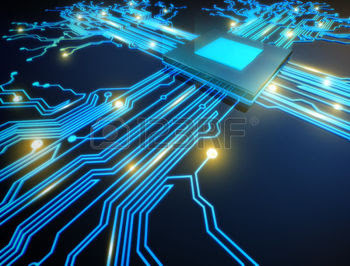 It is what receives the instructions from the computer operator, interprets the instructions into machine and sends it to the ALU unit for processing and interpret the processed result from the ALU to other component of the computer. Cache, serves as an high-speed memory where instructions can be copied to and retrieved. Putting all these together, we will say that the main function of the Central Processing Unit (CPU) of a computer is to receive the instructions from a computer operator, transmit the instructions to the necessary computer component that will perform the task (those necessary computer component that will perform the task are under constant direction from the CPU, because it is the CPU that translate/interprets the computer operator's instruction into machine language). The Task in lime color above refers to carrying out the instruction form the computer operator and bringing back the result to the operator. Thus, the CPU is not the chip that does the actual task from the computer operator, rather it is the chip that instruct the necessary chip/other computer component on how to perform the task. Just like how the human brain works. CPUs are located on the motherboard. Motherboards have a socket for this, which is specific for a certain type of processor. It gets very hot that is why it has own cooling system in the form of a heat sink and/or fan. Modern CPU is made up of different chips fused together as one. CPU perform it's calculations by turning on or off different transistors at a time. If you have a computer which it's CPU/Processor speed is 66MHz, it means that the CPU can control (turn on or off) 66 millions different transistors per seconds. Now you have seen the reason why CPU can get really hot.